A list of users that accessed the data. How frequently the data is accessed. How much data is stored in the account. Open your Data Lake Analytics account and select Diagnostic logs from the Monitor section. Next, select Turn on diagnostics. From Diagnostics settings, enter a Name for this logging configuration and then select logging options. You can choose to store/process the data in three different ways. 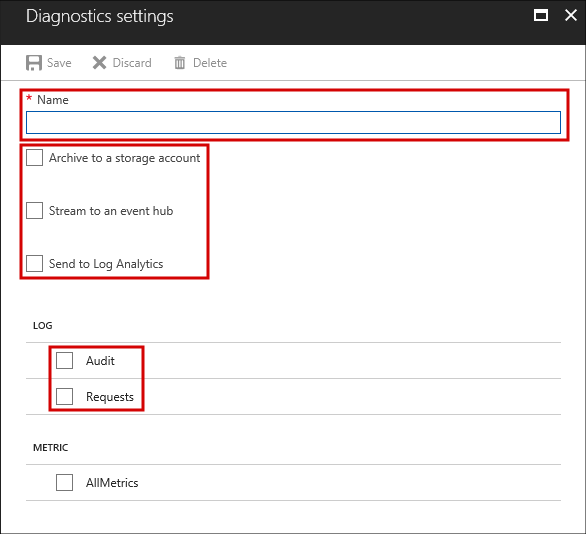 Select Archive to a storage account to store logs in an Azure storage account. Use this option if you want to archive the data. If you select this option, you must provide an Azure storage account to save the logs to. Select Stream to an Event Hub to stream log data to an Azure Event Hub. Use this option if you have a downstream processing pipeline that is analyzing incoming logs in real time. If you select this option, you must provide the details for the Azure Event Hub you want to use. Select Send to Log Analytics to send the data to the Azure Monitor service. Use this option if you want to use Azure Monitor logs to gather and analyze logs. Specify whether you want to get audit logs or request logs or both. A request log captures every API request. An audit log records all operations that are triggered by that API request. For Archive to a storage account, specify the number of days to retain the data. You must select either Archive to a storage account, Stream to an Event Hub or Send to Log Analytics before clicking the Save button. To display the blob containers that hold logging data, open the Azure Storage account used for Data Lake Analytics for logging, and then click Blobs. The container insights-logs-audit contains the audit logs. The container insights-logs-requests contains the request logs. The ## entries in the path contain the year, month, day, and hour in which the log was created. Data Lake Analytics creates one file every hour, so m= always contains a value of 00. The audit and request logs are in a structured JSON format. Here's a sample entry in the JSON-formatted request log. Each blob has one root object called records that contains an array of log objects. category String The log category. For example, Requests. operationName String Name of the operation that is logged. For example, GetAggregatedJobHistory. resultType String The status of the operation, For example, 200.
correlationId String The identifier of the log. This value can be used to group a set of related log entries. HttpMethod String The HTTP Method used for the operation. For example, GET. Here's a sample entry in the JSON-formatted audit log. Each blob has one root object called records that contains an array of log objects. category String The log category. For example, Audit. operationName String Name of the operation that is logged. For example, JobSubmitted. resultType String A substatus for the job status (operationName). resultSignature String Additional details on the job status (operationName). identity String The user that requested the operation. For example, susan@contoso.com. resultType and resultSignature provide information on the result of an operation, and only contain a value if an operation has completed. For example, they only contain a value when operationName contains a value of JobStarted or JobEnded. SubmitTime, StartTime, EndTime, and Parallelism provide information on an operation. These entries only contain a value if that operation has started or completed. For example, SubmitTime only contains a value after operationName has the value JobSubmitted. Azure Data Lake Analytics provides a sample on how to process and analyze the log data. You can find the sample at https://github.com/Azure/AzureDataLake/tree/master/Samples/AzureDiagnosticsSample.